Tech is proliferating at apace. Children are growing up in a world suffused with mobile phones, tablets, smart TVs, augmented reality, networked systems, etc., and the newly emerging Internet of Things. While using an array of devices and apps is second nature to them, it is much less the case for how well they understand how they work. There is a growing need for a more holistic thinking, one where technology is understood not only in terms of the components (i.e. hardware, software, data, and systems) but also how it fits together and how to combine it in innovative ways. Digital Fluency is intended to fill this gap. It is an innovative approach to integrating learning, emphasising the importance of moving seamlessly between exploring, learning and assimilating knowledge when harnessing today’s technologies. In a nutshell, it brings together disparate aspects of computer science, cognition, design, and everyday life – to provoke curiosity, deep learning and creativity. It was developed by an interdisciplinary team in the UCL Computer Science Department. To facilitate this new kind of learning, we have developed an extensive, tangible computing toolkit, called Magic Cubes – that fuses creativity and coding through a range of exciting and sometimes mysterious making and programing activities. For example, one minute someone can be using it to construct a cube, the next making a pattern of LEDs light up while shaking the cube, the next watching an interconnected set of cubes placed in a room light up like a Mexican wave. ​It is intended for hobbyists, school children and groups of all ages and interest to switch between making, experimenting, exploring, coding, explaining and to understand and apply fundamental concepts from data science, Internet of Things and Systems thinking. The graspable, colourful and intuitive cubes are packed with sensors and an LED matrix – providing tanatalising opportunities for anyone to get started straight away experimenting and exploring their environment and ideas. The goal is to make future generations become not only consumers, but also critical thinkers and active shapers of technology. Magic Cubes is tangible tech with a difference, comprising special building blocks that encourages collaborative exploration and making, and promotes a deep understanding of a diversity of tech concepts. The toolkit has been used at a number of schools and events, receiving rave reviews. Many groups have tried making it and creating games, and solving problems from different ages and backgrounds, including the Exploratorium in San Francisco, various BBC workshops, the Royal Institute lectures, and special needs schools. 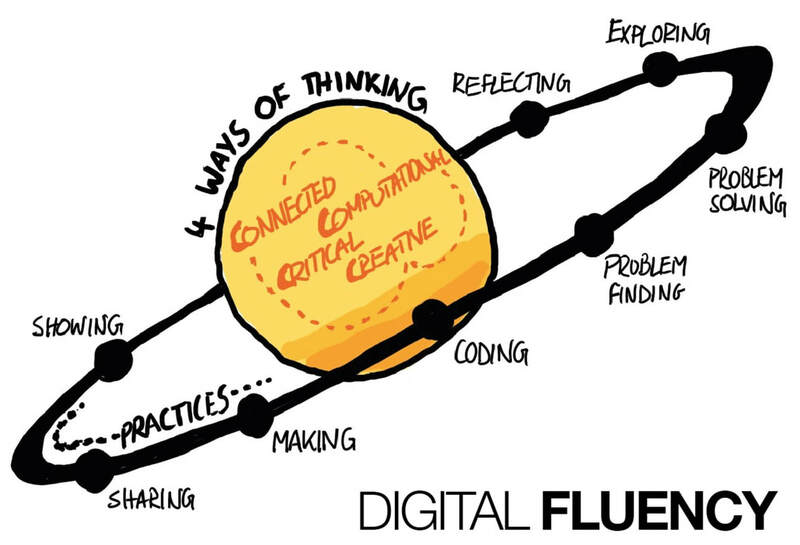 The Digital Fluency approach promotes the learning of 4 types of fundamental thinking: critical, computational, creative and connected. Students learn how to apply these when engaged in core learning activities for a given concept or topic: exploring, reflecting, making, coding, sharing, showing, problem-solving, problem-finding and collaborating.